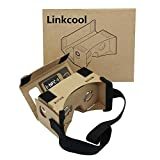 Linkccol V2.0 cardboard VR kit, and the perfect introduction to the world of Google Cardboard! 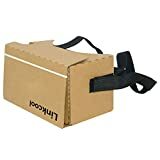 This headset comes in a protective cardboard sleeve, just slide the cardboard kit out to enjoy and slide it back in when not in use. The Conductive foam button give you complete control of your experience, works on both iOS and Android devices. The kit also includes Velcro strips to secure both the top and side panels of the VR Kit and a rubber band. Simply slip your Google Cardboard-enabled phone into the assembled kit to start experiencing breathtaking VR! Material:Cardboard +Lens+Magnet+Velcro Color:Box color, as shown in the picture. IOS OS:search "Cardboard" in App Store. Type: Unassembled DIY Cardboard Kit, 1-2 minutes assembly. Android OS:search "Cardboard" in Google Play (needs Android 4.1+).